Thanksgiving is one of the most important times of the year for most American families. The problem is that for many, cooking and cleaning up afterwards, can be incredibly stressful. That is why the last few years has seen an incredible growth in Thanksgiving dinners enjoyed in restaurants, or food businesses catering Thanksgiving dinners. This is great news for restaurants and related businesses as it is a great opportunity to make money and increase their customer base. However, while the customers get to experience a stress-free Thanksgiving, that is not the case for restaurants. Here are some important things that food businesses should do to get ready for Thanksgiving and avoid the stress. The most important thing to remember is that Thanksgiving preparations can take a lot of time, especially if your food business is planning on serving a large number of customers. Because of this, it is important to decide, at least several months in advance, whether or not you will be serving Thanksgiving dinner. Remember that choosing whether or not to be open on Thanksgiving is just one step in the process. You will also have to determine whether your business will only be doing carry out or if you will also have dine-in services (if you have a restaurant with a dining room). Don’t forget to consider whether you will be offering a delivery option as well; remember that this can increase your customer base but will make your job much more challenging. When getting your food business ready for Thanksgiving, one of the most important things you should keep in mind is having enough staff. As soon as you know that you will be open during the holidays, it is time to ask who will be available to work then. If you need to hire additional staff (which is very likely), do so right away and always make sure that they understand they will be working on Thanksgiving. It may be tempting to wait to hire people until Thanksgiving gets closer, but if you wait, you may have a hard time finding people who are willing to work. Choosing what food to serve on Thanksgiving is another very important decision. You need to decide if you want to stick to traditional options, give a new twist on classic dishes or think completely outside of the box. 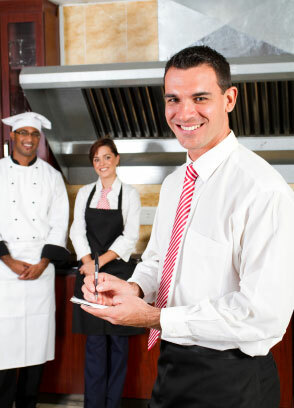 When planning the meal, consider how many customers you plan on serving and what cooking supplies you have. If you don’t have a lot of ovens, for example, you won’t be able to offer the traditional oven-roasted turkey to 50 families. It is important to be realistic when planning, because changing the menu at the last minute may upset customers. As with every other aspect of getting your food business ready for Thanksgiving, it is important to start advertising early. Many people view the holidays as incredibly stressful due to all of the preparation and will feel relieved to know they don’t have to make their own Thanksgiving dinner. If you already have loyal customers, they may be glad to discover that you will be open because they are already confident in the quality of your food. Advertising early is also a great way to get people thinking about their Thanksgiving plans before they are already formed, giving them the chance to eat at or cater from your restaurant. If you wait until a week or two before the holidays to advertise, chances are that everyone will have already made their plans. When creating your advertisements, don’t just mention that you will be open for Thanksgiving. Instead, mention what options you will be offering, both in terms of restaurant seating or catering, and what items will be on the menu. Even if a customer isn’t going to be cooking dinner themselves, they are going to want to know what you are serving before making a decision. Depending on your location and clientele, it may also be a good idea to mention whether or not if there is a maximum number of customers your food business will be able to serve. This will give the customers some incentive to make their reservations early.